TechCrunch founder Mike Arrington’s Internet tablet project is alive and well it seems, after photographs of the latest “CrunchPad” prototype were published online. In a blog post, Arrington says that the images were mistakingly leaked, although this is being questioned by many in the tech blogosphere, which has predictably worked itself into a frenzy. Whether or not the leak was intentional only Arrington knows, although comments attributed to him over at CrunchGear – a TechCrunch property – claim that the incident has “completely screwed” project partner Fusion Garage who’ve been instrumental in designing the latest prototype. This, along with photos depicting a very finished looking product, including what looks like retail packaging, suggest that the “CrunchPad” could be closer to market than Arrington is letting on. 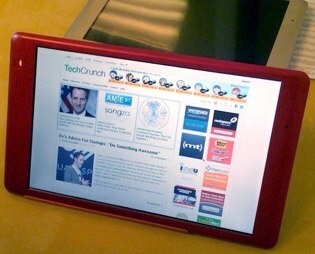 Mike Arrington's CrunchPad web tablet reaches prototype but should it go into production?